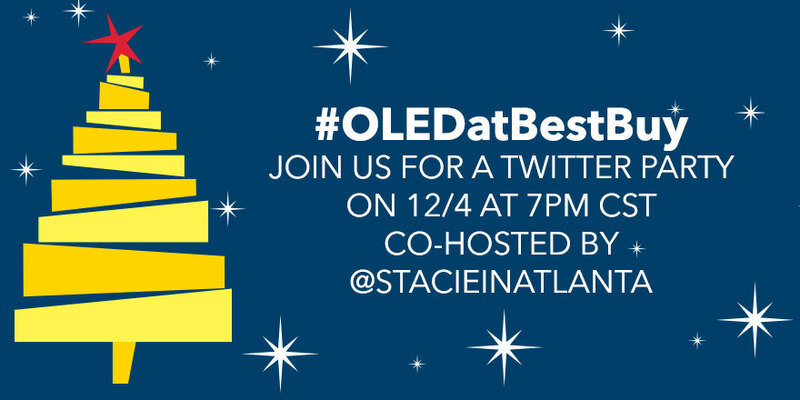 Make sure to RSVP before the party and use the hashtag #OLEDatBestBuy on ALL of your tweets! Be sure to follow the sponsor and all hosts, you must be present to win and must respond to the host directly via direct message who tweets your name announcing you have won. Hope to see all my butterflies there! Do you want Santa to bring you an OLED TV this Christmas? I love Best Buy. I do a ton of my shopping there. My husband would be ecstatic if we got an OLED TV this year. He talks about them all the time! Me Me Please. I want one. Amazing I keep hearing raves about this TV! I want to go see it for myself and drool! Party sounds great! Best Buy tech talk and $100.00 gift cards? Sounds awesome to me! Just got my new MacBook Pro from Best Buy last weekend. We had a ton of questions and their Blue Shirts are VERY knowledgable!! This looks like one Ah-Maz-Ing television! I want one myself.! Best Buy is the only store I go to for electronics. They have the best of everything there. I love shopping Best Buy. It's my first stop for my husbands holiday shopping. And YES! I would love that TV from Best Buy! Best Buy always has a lot of great stuff. I would love a new TV for Christmas. I caught the tail end of the Twitter party. I forgot all about it. Best Buy has the best gifts! I would love one of the TV's! I think Best Buy is my hubs favorite store. I'd love to get a new TV for the family room for the holidays! I hope you had an amazing turnout at your Twitter party. I'm sorry I missed it! Hope to make it to the event! Love their selection and pricing. I always go to Best Buy when i am looking for new electronics. I love the great customer service. Best Buy is amazing! They always have the best sales and great Christmas gift ideas. Best Buy Gift Cards are a wonderful thing! Sorry i missed this chat. I was out celebrating my moms bday. I would love for Santa to bring me a new TV this year, especially since our 3-year old smashed our new/old tv a few weeks back. Awww I missed it. They always have parties when I am at work. I love Best Buy. That tv sounds amazing. Sounds like it was fun! I'm sorry I missed it. A new TV is on hubby and I's wishlist for Christmas! We will certainly check this one out! we love best buy. shopping there this holiday season!! What a great idea, thanks for sharing. A new TV for us would be great for our girls room and our bedroom just because we have these big honking old ones that don't have good color quality but I am thankful they do at least work! We are a family of six so we must have at least 2 TV's .... having three, even if two are OLD, are a blessing! Sounds like a super fun Twitter Party! We love Best Buy! I hate I missed the Twitter party. :( I love Best Buy... it's my go-to electronic/gadget/appliance store!